Was designed to fit Veeder Root model 7886 or 7887 meter-registers. 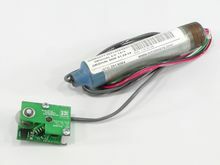 The VR1 Pulser was designed to fit the Veeder Root model 7886 or 7887 meter-registers. It contains the same direction sensing technology as the SP1 pulser, which eliminates pulse errors due to vibration or meter backlash. The VR1 pulser brings electronic pump accuracy to commercial fueling. Fits both 7886 and 7887 meter-registers. Fits inside existing meter-register cabinet for easy installation. Generates either 1, 10, or 100 pulses per gallon. Microprocessor controlled direction sensing eliminates over-counts due to pump vibration or meter backlash. Up to 2500 gallons/minute on 7886 and 250 gallons/minute on 7887. Stainless Steel encoder wheel is impervious to the elements. Dual bearing construction promotes long pulser life. Configuration setting made in pulser head for easy access. Intrinsically safe circuitry, no conduit required! Environmentally coated circuitry eliminates moisture problems. Heavily filtered power supply eliminates noise problems. 12VDC and 120VAC models available.